Our child was born healthy in Patnagarh. But 12 hours after his birth, he cried relentlessly and did not take milk. The next day he suffered a fit and the attending doctor put him to oxygen. 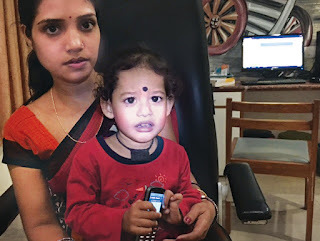 A sequence of referrals for specialized care to arrest our baby's seizures followed - the Special Care Unit for newborn babies at the district hospital in Balangir, the VIMSAR Burla Neonatal Care Unit, NIMHANS in Bangalore, and then AIIMS at Bhubaneswar. It was at AIIMS that a pediatric professor said our baby’s vision was affected and the related nerves were probably damaged beyond recovery. We were referred to Dr Vivek Warkad at LVPEI Bhubaneswar. At LVPEI, Dr Warkad conducted a surgery. Thereafter he advised “vision rehabilitation” with different materials, coloured lights and balls, etc, which we regularly keep up with. Now, our son is able to identify his father, mother and others using vision and sound. He also identifies primary colours, common animals and birds, even from a distance of 10m! We are grateful to God, LVPEI and especially to Dr Warkad that our son is able to see the colours and sights of the world.